Follow this tutorial to make your own Crystal Goddess Crown with LEDs! I'm just starting out with electronics, and I'm trying to wrap my head around how long something can run from a battery. If I understand correctly, this light draws 20 mAh at 3.4v. A single, AA alkaline battery can store about 2,000 maH at 1.23v, so two of them in series would be about 2.5v at 2,000mAh, which would power one light for about 100hrs? IS that correct? 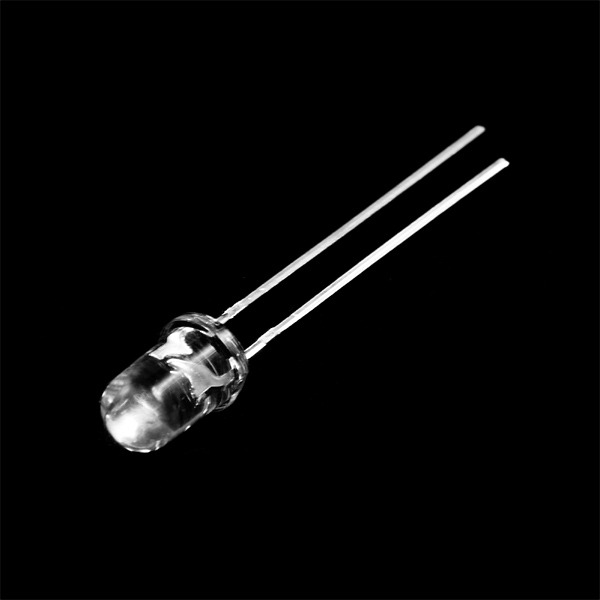 Will the light operate at 2.5v when it's rated for 3.4v? Is 3.4v a max? If you ran 8 lights off of two AAs, wouldn't they have a max run time of about 12.5 hours (100 / 8)? Sorta, fresh alkaline AA are supposed to be at 1.5V(Ni-mh rechargeables are 1.2V, but that's not important right now). So two AAs would be 3 volts and that's probably enough voltage to turn this on, even though the stated minimum is 3.2, it'll just be a tiny bit dimmer. If a AA has a 2000mA capacity (they often have more than that, and don't confuse my use of the word "capacity" with capacitance, which is a completely different issue), then it can source 2000mA total before it's dead. The battery can however provide more than 2000mA of current. When we measure Amps, we measure how much electricity goes through a medium per hour. So, if we drew 2000mA from our battery, it would last 1 hour. However, if we drew 4000mA from our battery, we could only do that for 30 minutes. Likewise we could draw 1mA, and it would last 2000 hours. When we use two batteries, we have a choice: do we hook them up in parallel, or in series. Now our AA battery will have an upper limit to how many mA we can draw from it at once, say 6000mA. If we hook them up in series(connect the + of one battery to the - of the other and use them like one battery) that limit is still 6000mA. But the voltage went up from 1.5V to 3V, and our total mA capacity went up too, from 2000mA to 4000mA. So now if we draw 2000mA from our two battery cell, it will last for 2 hours. If we hook them up in parallel, we connect the + of both batteries to each other and the - of each to each other. Then, to use our cell, we draw from the connections between the batteries. In this setup, the voltage stays at 1.5V, and the total capacity is still at 4000mA, but our upper limit went up to 12000mA (6000 from one battery, and 6000 from the other). Since we want 3V, we'll hook our batteries is series. 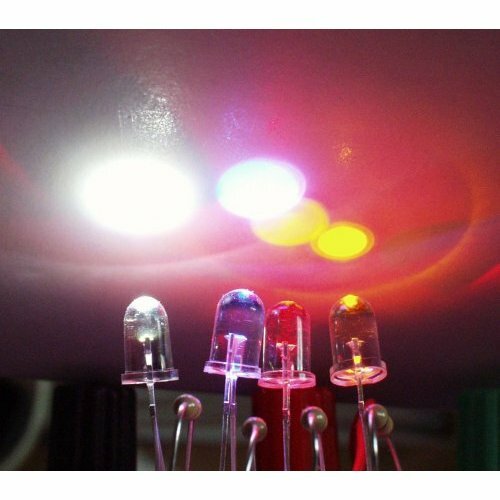 The stated max current for these leds is 20 mA, this is much more important than voltage, because Leds have an interesting property that they will let any amount of current through them(that entire upper limit), even if it destroys it, so we must externally limit the current. To limit current, we use resistance, and Ohm's law: V=IR. This is pretty simple once you get the hang of it. V stands for voltage, I for current(in Amps), and R for resistance. When we want to limit the current, we put in our voltage and target current and it gives us the resistance we need to get that current. The unit for resistance is ohms, so our answer is 150 ohms. Then to limit the current to exactly 20mA, we use a 150 ohm resistor. Now, resistor values are pretty standardized, and you'll have a hard time finding a 150 ohm. To much current will kill the led, so it's better to use a higher ohm resistor than a lower one, so a 200 ohm resistor would be a good start(it'll still be very bright). You know something, you're right! I had that wrong, thank you for correcting me and my ignorance. 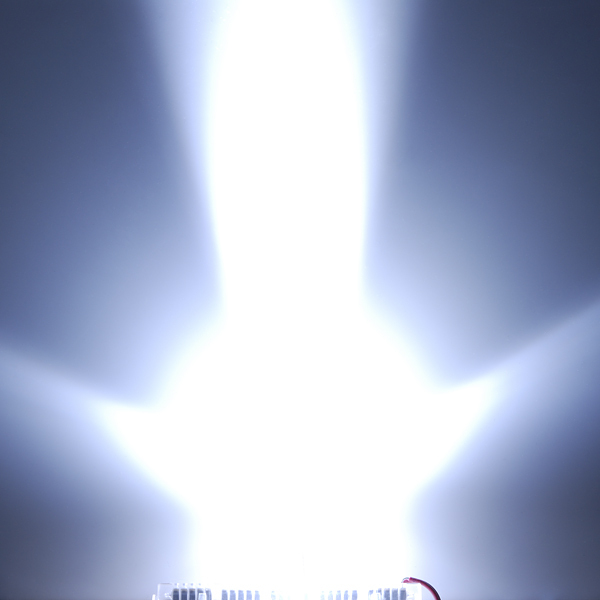 Apparently, I have been running my leds criminally low ever since I got into this. SO.. Then if you're limiting the current based on the difference between the supply and the voltage drop of the LED, if we had (as an easy fictional example) a 3v drop on an LED, and we ran it w/ 2x AA battery at exactly 3v, we would not need ANY resistor? And, extrapolating from that assumption, I could use 12v and run FOUR of these fictional 3v voltage drop LEDs in series with no problem? If that's the case, can I estimate the battery life based on the current rating of the LED (ie: 20ma, meaning that it would run 100 hours off of the 2 AA batteries with 2000mah each in my example)? Hey, at least they'll last longer. 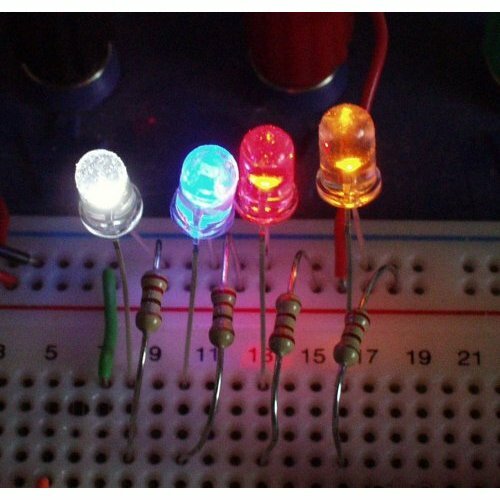 You could also use a joule thief to run them even longer! Just for the record, I had to run the calculations this weekend for a project I was working on, and according to http://bit.ly/9PicL8, if you want to drive this off of 5v, you should use an 82 Ohm resistor. I am thinking about making a sunrise alarm clock. Would a set of these be bright enough to light up a room? Or at least bright enough to wake me up if I point that at my pillow? could these be dimmed using a stronger resistor? Or would that damage/turn these LED's off? They still require a resistor. If you are running them off of batteries without a resistor, then you are relying on the internal resistance of the batteries and the LED to limit current, a dangerous way to run LEDs. So they may work on a Lithium coin cell, or two AA batteries, but burn out on a Lithium Ion rechargeable or a couple of C cells. I'm gonna make a reading lamp... with 2 of these. 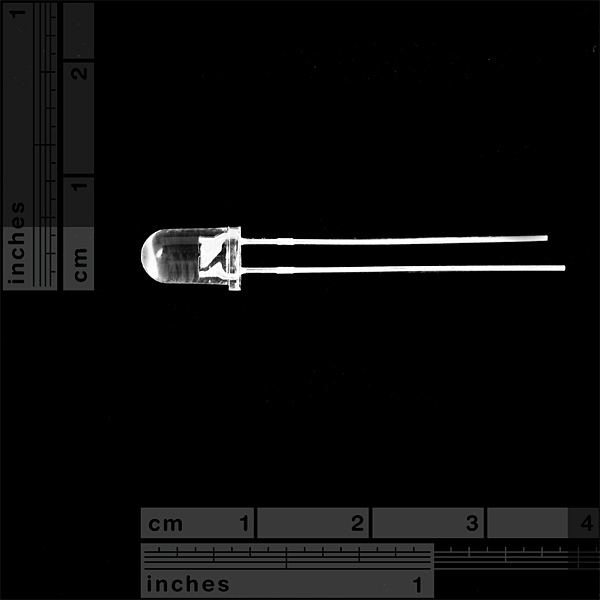 what is the MCD output for this led? According to the datasheet, it peaks at 10,000 mcd. In particular, I need to know the color temperature and the viewing angle. Works fine. Did not come with any spec's. Had to go to the WEB to get info. Completely unmarked. I suggest all manufactures put identifying marks on there parts. Unless they are made in China, burn up and then they don't want to be identified.. 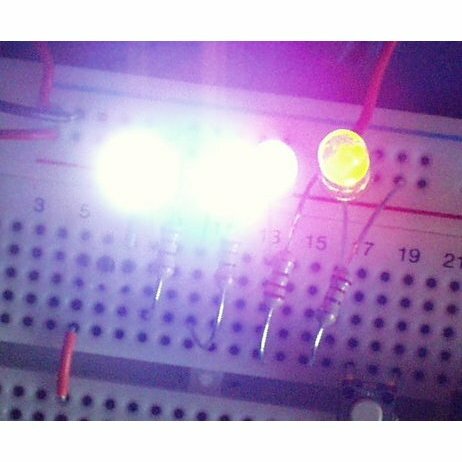 These LEDs worked perfectly on a 200 ohm resistor. They are as bright as advertised and worked perfectly.